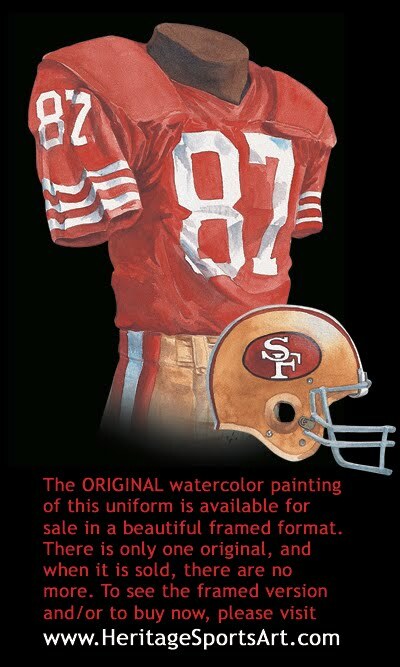 Please click on the evolution of the 49ers uniform poster above for a close-up version of the poster. The descriptions below give you some insight and background about the uniforms and/or eras depicted in the poster. Football takes flight in the ‘Bay Area’ – the 49ers join the ‘All-America Football Conference’ in 1946. The AAFC was a rival league to the NFL, competing for fans and players. In its inaugural season the had 8 teams: Brooklyn Dodgers; Buffalo Bills; Chicago Rockets; Cleveland Browns; Los Angeles Dons; Miami Seahawks; New York Yankees; San Francisco 49ers. It gets a bit confusing because one might assume that at least 3 of these teams (Buffalo Bills, Cleveland Browns and the 49ers) went on to join the NFL in 1950 when the AAFC and the NFL agreed to a truce, but in fact the deal was that the NFL would take in the AAFC’s two best teams, the Browns and the 49ers, plus the lowly Baltimore Colts (who folded after one season in the NFL). The rest of the AAFC teams simply ceased operations. The 49ers played their home games in Kezar Stadium. Anthony J. Morabito, the team’s owner, named the team as such to reflect the city’s ties to the 1849 California Gold Rush in the Sierra Nevada mountains east of San Francisco. Under the leadership & tutelage of coach Lawrence T. Shaw, the 49ers’ AAFC 4-year record would be a very impressive 39-15-2 – a sign of success to come to this franchise in the next 50 years. These first few years were synonymous with Strzykalski rushes, Beals receptions and Albert passes. With respect to the helmets, almost all helmets in this era lacked facial protection and would continue that way well into the 50’s. 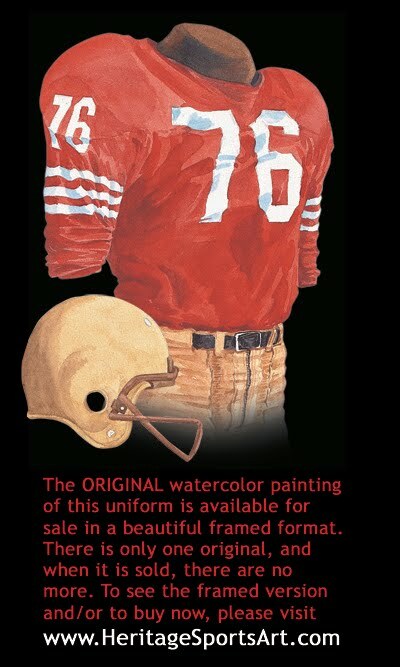 The significant difference in the 1946 and 1947 49ers uniforms was the switch from white to silver for the pants and helmets. 1948-1952 - Silver (according to Martin Jacobs, in 1947 Mrs. Shaw wanted the team to wear silver pants to honour her husband/team owner Buck “The Silver Fox” Shaw. 1964-Present - Gold with modest exceptions when the team wore throwback uniforms or colour rush uniforms. 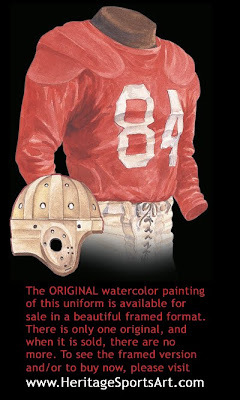 Note: What I am now calling the 1947 uniform artwork started out as 1948 artwork, but in 1948 the team wore silver pants and a silver helmet, so I should have identified this artwork with gold pants and gold helmet as being 1947. The 49ers are now part of the 12 team NFL, playing in the National Conference. They finished a respectable 7-5, ahead of the Packers and the Bears. 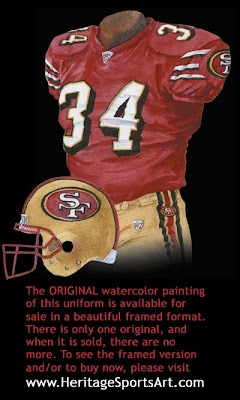 This is the style of jersey that was worn by 49er rookie, and soon-to-be legend Hugh McElhenny – drafted from the University of Washington. The first time halfback McElhenny touched the ball, he scampered 42 yards for a touchdown! ‘The King’ (as he was nicknamed by QB Frankie Albert) quickly became known for his shiftiness & elusiveness – together with Joe Perry, these two would form the 49ers ‘million-dollar backfield’. 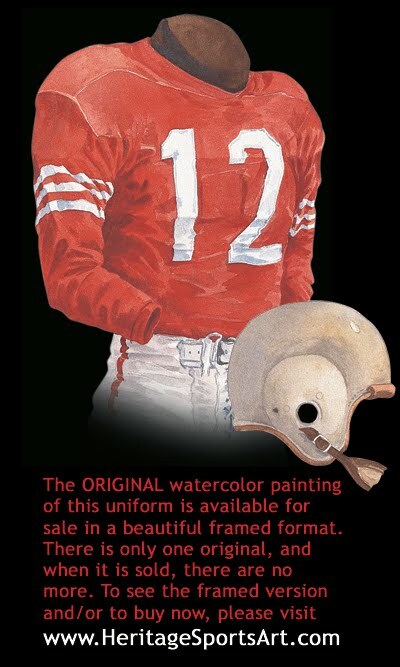 Note that by 1952 the 49ers had added three white stripes to the jersey, a staple for years to come. Note also the helmet and the lack of a face mask – it was the player’s choice whether or not to wear a face protector, and most opted not to wear one until the mid to late 50’s. It’s amazing, but the 1958 San Francisco jersey has undergone very minor or subtle changes since 1952 – in fact, this could be said for the home red jersey right up to the early 90’s! 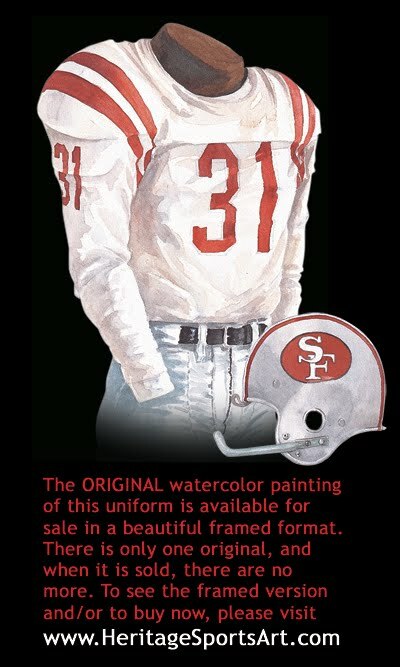 The tan/gold pants, the red shirt with three stripes and white numbers evident in this painting were the staples of 49ers’ home uniforms for another almost 40 seasons. Note that the 1958 uniform features pants with a zippered front, and numbers on the sleeves, and by this time most helmets had face guards. 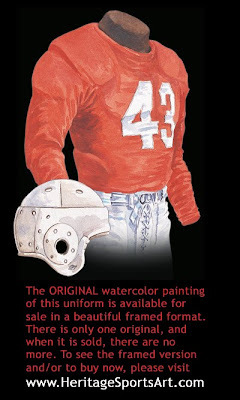 The ’58 helmet, however, still had no logo on it. In 1958 the NFL is still a 12 team league, divided into 6 team Eastern and Western Conferences. The 49ers play in the west, and they finished with a 6-6 record. The 1950’s are a relatively successful decade for the 49ers, who enjoy 7 seasons of .500 ball or better. That being said, they advanced to post season play only once, in 1957, losing a heartbreaker to the Lions 31-27 in the Western Conference Championship game. Allow us to honor some 49er greats who played for the team in the 50’s by mentioning their names - Frankie Albert, Y. A. Tittle, Hugh McElhenny, Joe Perry, Bob St. Clair, Leo Nomellini. All were great players who contributed to the 49ers legend and fan base. Note: What I am now calling the 1958 uniform artwork started out as 1959 artwork, but in 1959 the team wore silver pants and a silver helmet, so I should have identified this artwork with gold pants and gold helmet as being 1958. There’s a general rule in the NFL that the home team wears a dark uniform and the visitors a light colored one (unless altered at the request of the home team). The ’63 uniform depicted here is the 49ers 1963 AWAY uniform. Notice the striping, which is almost vertical and much higher-up on the shoulders than earlier editions. Note also the inclusion of the legendary 49ers logo on the helmet. This logo on an intersecting “S” and “F”, has only gone through minimal changes right up to the present, much like their home jersey remained largely the same for so many years. The 1963 season wasn’t particularly kind to the 49ers, as they finished with a 4-10 record, last in the 7 team Western Conference. In fact, for most seasons in the 60’s the 49ers hover around .500, and fail to make post season play between 1958 and 1969. 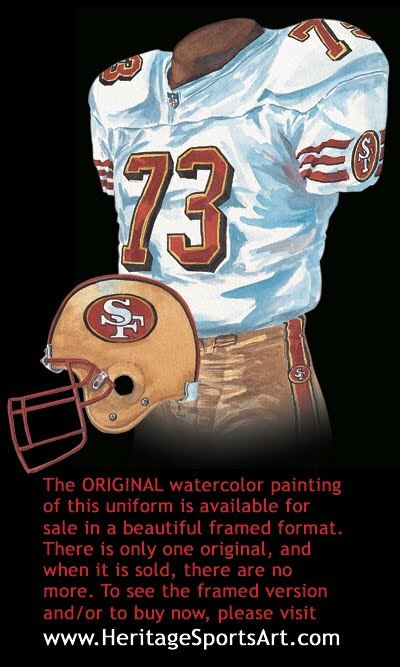 The ’72 jersey has now been modified to a short sleeve, and other than the addition of red and white pants stripes, it’s quite similar to the home uniforms of the 50’s and 60’s. By this time the helmet is now the familiar gold color, and the helmet logo appears almost identical to the present day logo (although there are minor differences). By this time the NFL and AFL have merged, and the NFL is now a 26 team league divided into two conferences, each with 3 divisions. The ’72 49ers finish with an 8-5-1 record and win the NFC West. In a thriller of a game, they face the Cowboys at home at Candlestick Park, but Dallas scores 17 unanswered points in the 4th quarter to knock off the 49ers 30-28. This was the 49ers 3rd playoff appearance in a row, but their last until 1981. What a ride – after finishing 1978 and 1979 with identical 2-12 records, and 1980 with a 6-10 mark, the 49ers come alive in 1981 with a league best 13-3 record and roar into the playoffs for the first time since 1972. And it doesn’t stop there for the Joe Montana-led 49ers (Montana joined the team in 1979 out of Notre Dame). After beating the Giants 38-24, they knock off Dallas 28-27 in one of the most memorable 49ers games (and perhaps NFL games) ever played. This game was won with “The Catch”, a 6 yard pass from Joe Montana to an over-extended Dwight Clark that changed the course of 49ers history. Then the 49ers met the surprisingly strong Cincinnati Bengals in Super Bowl XVI. At the Silverdome in Pontiac, Michigan, in front of 81,270 fans, the 49ers come from behind to beat the Cincinnati Bengals 26-21 to capture their first of 5 Super Bowls in the next 14 years (1981, 1984, 1988, 1989, 1994), and Joe Montana wins his first Super Bowl MVP award. The 1981 visitors jersey shown here should seem quite familiar to 49ers fans of all ages – the present version is not much changed from this one. The Joe Montana – Coach Bill Walsh dynasty continues. After an off year in the strike shortened 1982 season, and a disappointing loss to the Redskins in 1983, the 49ers roar back in 1984 with a 15-1 regular season record. Then in the playoffs they handle the Giants 21-10 and shut out the Bears 21-0, and go on to meet Dan Marino and the Dolphins in Super Bowl XIX. Once again, riding the arm of Joe Montana, who goes 24 for 35 with no interceptions, the 49ers roll over the Dolphins 38-16 at Stanford Stadium in Palo Alto, California. This is the second of the 49ers 5 Super Bowls over a 14 year period (1981, 1984, 1988, 1989, 1994), and Joe Montana wins his second Super Bowl MVP award. In winning 5 Super Bowl Championships, the 49ers join Dallas as the only teams to have won 5 Super Bowls. The 49ers go 10-6 in 1985, 10-5-1 in 1986, and 13-2 in 1987, but get knocked off in the first round of the playoffs each time. But the story doesn’t end there. Enter Jerry Rice and Roger Craig. Like a well oiled machine, the 49ers win back-to-back Super Bowls in 1988 and 1989. In 1988, a year of great parity in the NFL, the 49ers finish with a 10-6 record along with the LA Rams and the New Orleans Saints. In round 1 of the 49ers’ playoffs, they clobber the Vikings 34-9. Next up were the Chicago Bears, who go down to defeat 28-3. Then it was on to Joe Robbie Stadium in Miami to face Boomer Esiason and the Cincinnati Bengals in Super Bowl XXIII. In a game reminiscent of the 1981 Super Bowl game between the same two teams, the 49ers come from behind to down the Bengals 20-16. This time out Jerry Rice takes home the hardware, and Joe Montana goes 23 for 36 with no interceptions. And a quick word has to be said about coach Bill Walsh who retired from NFL coaching after the 1988 season: in 10 years as the Niners' coach, Walsh had a 102-62-1 record, won six NFC West titles and three Super Bowls. Yikes! 1989? It’s déjà vu all over again. The 49ers roll through the regular season with a 14-2 mark, then beat the Vikings 41-13 and the LA Rams 30-3. The next victims were the Denver Broncos in Super Bowl XXIV at the Superdome in New Orleans. And victims is the right word as the 49ers crush John Elway and the Broncos 55-10 in one of the most lopsided Super Bowl games ever played. Once again Montana goes 24 for 32 with no interceptions and wins his third Super Bowl MVP. This is the fourth of the 49ers 5 Super Bowls over a 14 year period (1981, 1984, 1988, 1989, 1994). 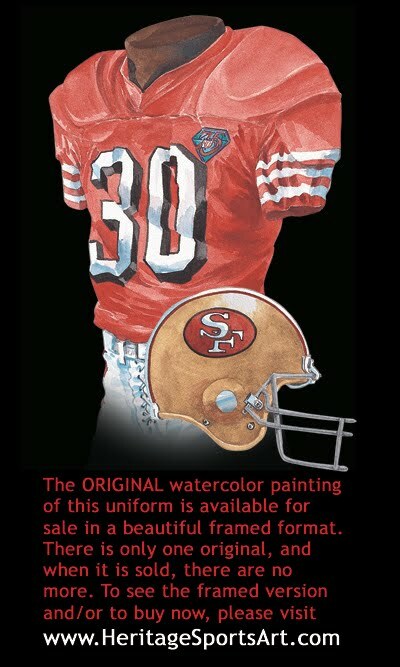 The ’88 & ’89 jerseys shown here highlight the consistency of the 49ers uniform for the past 30 years. It’s a simple design with colors you wouldn’t think would work (red, gold and white), but do. Some of the names have changed but the result doesn’t – gone are Bill Walsh and Joe Montana and Roger Craig and Ronnie Lott and many others, but Steve Young picks right up where Joe left off. The 49ers finish the season 13-3, then beat Chicago 44-15 and in a memorable clash of titans, the Cowboys 38-28. Thus in Super Bowl XXIX the 49ers faced their in-state rivals, the surprising San Diego Chargers. This time out Young fires to Rice for 3 TD’s, and the 49ers roll to a 49-26 win in front of 74,107 fans at Joe Robbie Stadium in Miami. Chalk up an MVP award for Mr. Young. 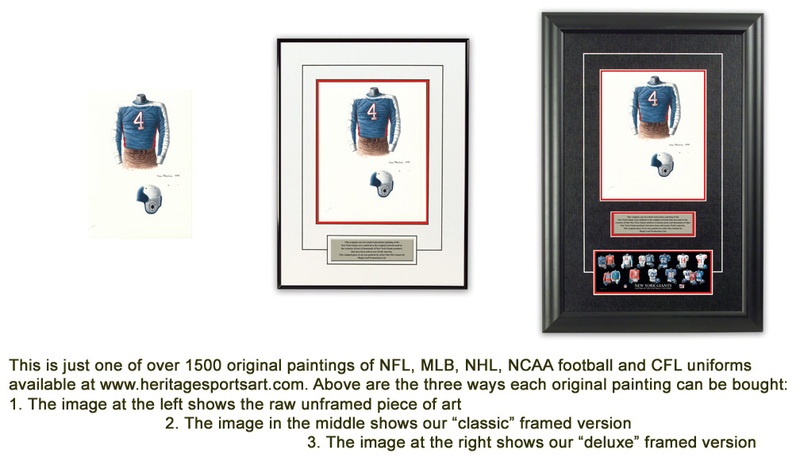 This is the fifth of the 49ers 5 Super Bowls over a 14 year period (1981, 1984, 1988, 1989, 1994). 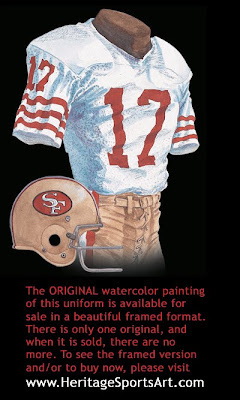 The 49ers jersey showcased here is a throwback jersey designed to honor the 1957 49ers uniform, and features a unique drop shadow effect for the uniform number on the front of the jersey, as well as white pants with red and black stripes. There are some interesting variations to this 1996 home uniform: a thin, gold trim has been added to the number/drop shadow. 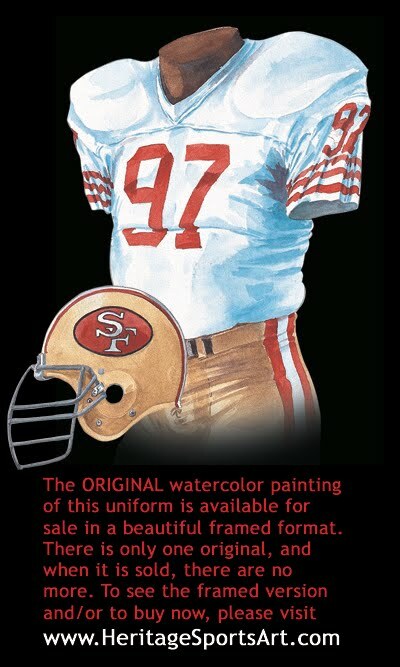 The 49ers added their logo to both sleeves – marking the first time that we’ve seen their logo on their jersey. The numbers are much higher on the shoulder than previously seen. Furthermore, the face guard is now a maroon/red instead of a silver-grey. Interestingly, the 49ers went back to the ‘white’ pants in 1996 – the pants were white in the ’94 throwback year, then switched to gold in ’95. 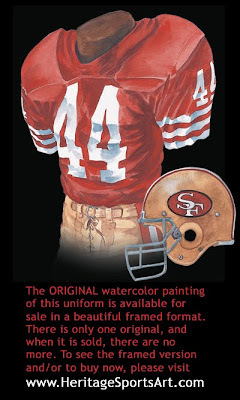 Finally, note the special commemorative patch on the left shoulder – celebrating the 49ers’ 50th anniversary (see the description of the 1946 jersey above for some history about the 49ers’ first season in 1946). In 1996 the 49ers again have a remarkable regular season, going 12-4. Leaving aside the strike shortened 1982 season, from 1981 to 1998 the 49ers will never lose more than 6 games in a season, compiling a stratospheric 207-72-1 regular season record in this 18 year period, and a gaudy 22-11 post season record. Now a quick word about coach George Seifert: Seifert's record with the 49ers is probably without equal - between 1989 and 1996, he led San Francisco to a regular-season record of 108-35 and he won Super Bowls XXIV and XXIX. If winning percentages mean anything, Seifert deserves immense praise. After such a long period of dominance, the 49ers have come back to earth in 1999 and 2000 (records of 4-12 and 6-10). You almost had to expect this, and the wonderful thing is that seems to be all sorts of cause for optimism for the Jeff Garcia led 49ers. A couple points about the 2000 uniform: If you look very closely, you’ll also notice a mini ‘SF’ logo amidst the striping on the pants – a little nuance that was added beginning in the ’98 season. Also, if you look closely at almost all NFL uniforms worn from 1991 on, you’ll note a small NFL shield patch on the jersey’s neckline. Most NFL uniforms added the NFL logo patch to the neck, and to the upper left thigh of the pants, beginning in 1991. The only major exception to this practice was in 1994 when the teams wore their throwback uniforms. 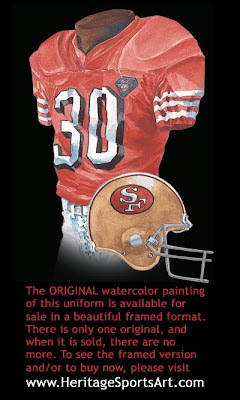 In this case, the 49ers have the NFL patch on their jersey, but not on their pants – one of the rare exceptions since 1991. Thanks Scott. 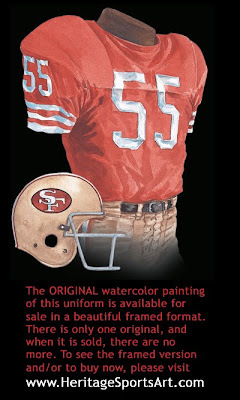 If the 49ers decide to have a throwback uniform then 1963 should be their starting point. Silver and Red, a great combination. 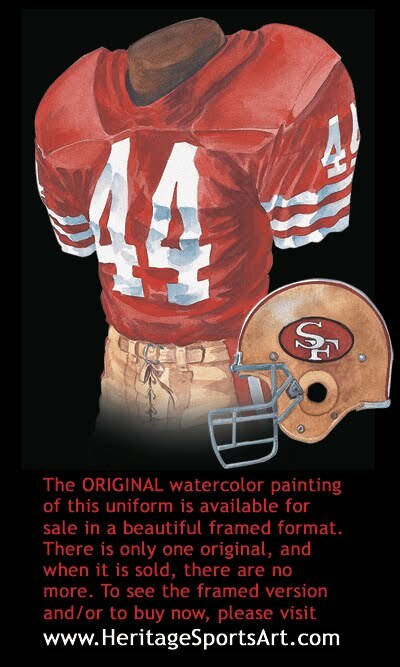 Thanks for your note and you are right, the 49ers did wear a red hemet for some parts of the following seasons: 1950, 1951, 1953, 1954, 1955 and 1956. 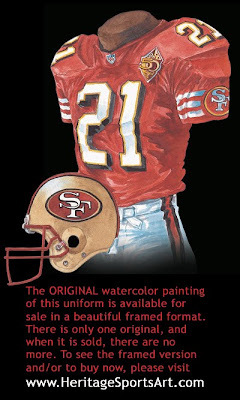 If we add a vintage uniform to our collection, I'd like to do one of these uniforms with a red helmet.